Photograph of French war orphan "adopted" by the Americans. Ramburvillars, October 27, 1918. There were 899,500 war orphans in France, many of whom had also lost their mothers. The story of the plight of the children in the war area is one of the most tragic chapters in the history of modem civilization. "We may enter in some slight degree into the misfortunes of one fatherless child. It is to a slight degree only, for no one of us really knows the child's soul. But it is absolutely beyond the range of our powers of imagination and sympathy to form any notion whatever of what fatherlessness means to 899,500 children. Long before we had comprehended more than a minute fraction, we should cry out in distress and beg for any other fate rather than that of wholly understanding what such figures mean. "How many children were made orphans by the war, God only knows. There are millions and millions. Probably nearer ten million than five. They are not only in Europe but in all parts of Asia, to the remote parts of China and in many widely scattered areas of the Black Continent. They have been hungry literally for years and that means an under-nourishment that is bound to stunt their growth, to weaken their resistance to disease, and to make them easier victims of the epidemics which they must face from time to time. For years they have been, many of them, living in an atmosphere of fear, which must color their whole lives. They have been denied the restraining companionship of their fathers and older brother's and in great numbers of families, of their mothers. They have been in an atmosphere of killing, destruction and hate during the most impressionable years of their lives, leaving an impress which nothing can erase. After the signing of the Armistice, relief agencies made heroic efforts to alleviate the suffering of starvation and disease. 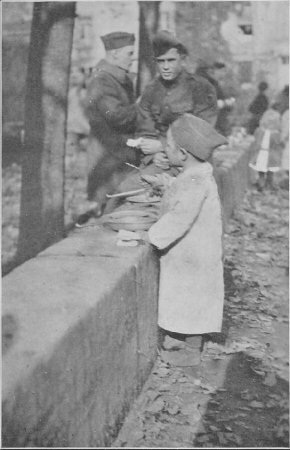 The European Children's Relief Bureau, organized February, 1919, Herbert Hoover, Chairman, distributed food and supplies to the value of $6,625,051.36. The European Relief Council a consolidation of nine American social organizations, distributed supplies amounting to $29,556,071.90. The total American relief deliveries, devoted mainly to the relief of children during the reconstruction period (1919-1923), was $220,704,581.78. Despite this generous contribution, millions perished. In addition to these five billion dollars sent through accredited agencies, private individuals and families sent to distressed relatives in the war areas thousands of dollars, the total of which can not be estimated with any degree of accuracy. *Human Costs of the War, by Homer Folks. By special permission of Harper & Brothers.